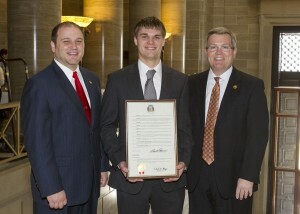 Representative Denny Hoskins, Eric Czerniewski and Senator David Pearce in the Missouri Senate Chamber. 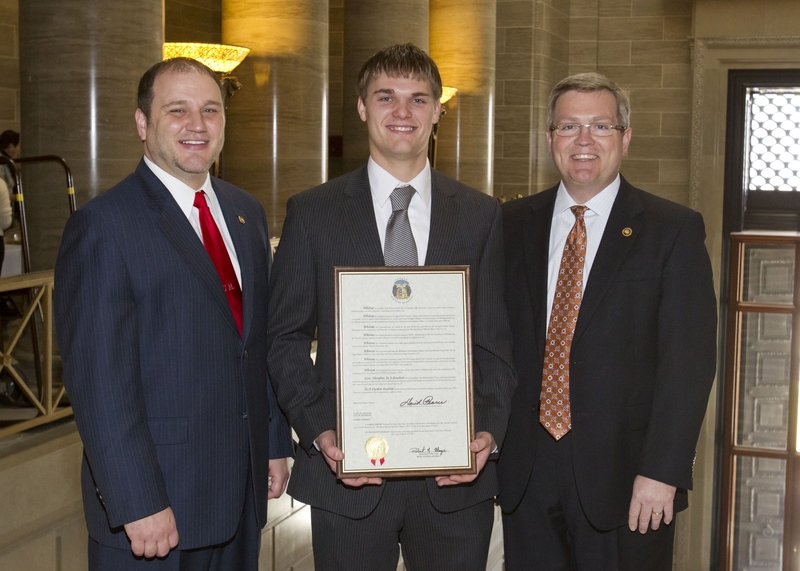 Former University of Central Missouri Mules quarterback Eric Czerniewski was honored in front of the Missouri House of Representatives and Senate at the State Capitol in Jefferson City on Wednesday, for his successful 2010 season, winning the Harlon Hill Trophy. Representative Denny Hoskins read a proclamation in front of the House and Senator David Pearce honored him in the Missouri Senate Chamber. Czerniewski was also honored by Representative Bart Korman of District 99, and Senator Dan Brown of District 16, encompassing his home town of Montgomery City. Czerniewski signed autographs for several Representatives and Senators following the proclamation as well. Czerniewski was named the Harlon Hill Award winner for the nation’s top Division II Player on December 17, 2010. 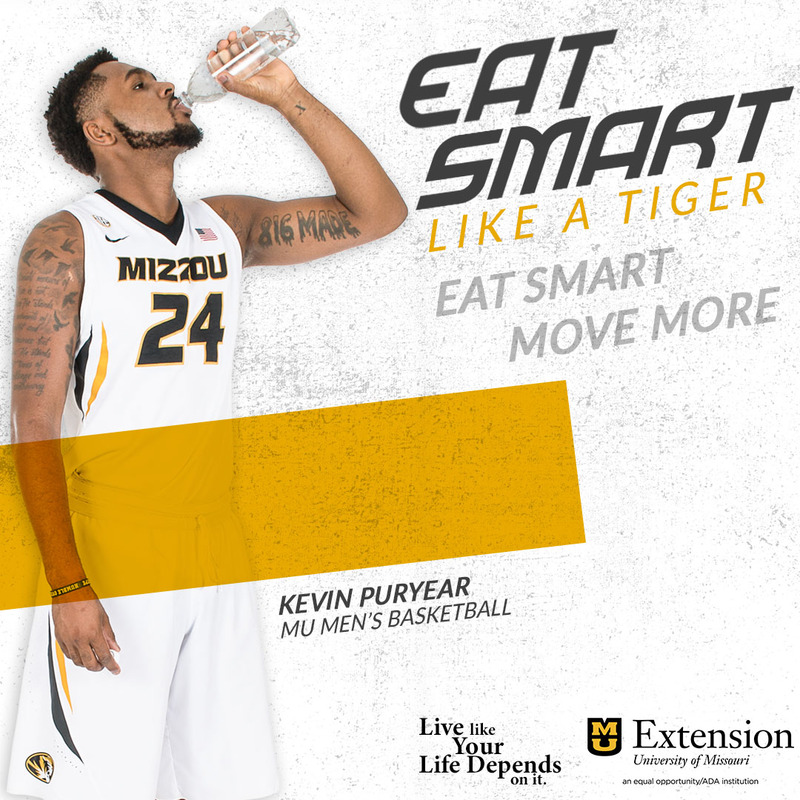 From Montgomery City, he is the first Missouri native ever to win the award, and the first MIAA player since 1998 to take it home. Czerniewski was also named the first-team All-American quarterback by the AFCA, AP and Daktronics. He was named the Ron Lenz National Offensive Player of the Year as well. He led the nation in passing yards (5,207), touchdown passes (46), and total offense (5,203), and broke the NCAA-II record for yards passing in a season. He also shattered every single-season passing record at UCM and in the MIAA. He was named the MIAA Offensive Player of the Year, the Super Region 4 Offensive Player of the Year, and to the conference and region first-teams. He completed a record 447-of-670 passes, good for 66.7 percent. He averaged 371.9 yards per game, with an efficiency rating of 150.2. He threw for more than 300 yards 10 times this year, and more than 200 yards in every game. Czerniewski also finished his career ranked No. 4 in NCAA-II history and first in MIAA history with 12,847 yards passing. He has shattered more than 20 school records, including career marks like completions (1,043), touchdowns (107), yards, total offense (12,978) and attempts (1,678).